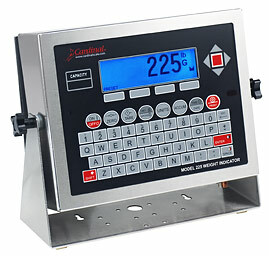 Cardinal Scale’s New Unattended Weighing Terminals are Loaded with Valuable Features. Cardinal Scale’s new USA-made Satellite series unattended weighing kiosks provide the ultimate experience in unmanned truck scale efficiency and streamlined data integration. The lockable, weather-proof enclosure features a modern design aesthetic with optional rainhood/sun deflector. Select a Satellite model with the features you need including a high-speed thermal cutbar tape printer, proximity badge reader (AWID and HID), 240 x 64 pixel blue backlit LCD or 640 x 480 pixel backlit color touch screen LCD, and with or without a rainhood. True to its name, the Satellite offers independent remote control over your weighing operations and connects the truck scale to SB500 remote displays with integrated traffic signals, existing computer networks, other digital weight indicators, and WinVRS vehicle recording software. The weatherproof QWERTY keyboard with navigation arrow keys and main soft keys provides driver input prompting controls. Fast, accurate, and easy to operate, the Satellite series offers models with a brilliant full-color graphics LCD touch-screen display and 10/100 Base-T Ethernet standard (TCP/IP or EIP). The Satellite may be mounted on a wall or pole (complete mounting bracket included), and the unique articulating arm allows the kiosk to be pulled toward the truck driver while weighing and then retracted away from the truck when not in use. These unattended weighing terminals allow the driver to remain in their vehicle while weighing which reduces the risk associated with walking across truck scale platforms and traffic lanes. Not only is this a safer method of receiving truck weights, but it also speeds the weighing process for optimal efficiency and reduces overall operating costs.The Satellite kiosk may be interfaced via Wi-Fi or wired Ethernet to Cardinal’s WinVRS Vehicle Recording System for seamless acquisition and integration of weight data to generate versatile reports of transactions. Truck ID storage comes standard in the Satellite series, and versatile connectivity ports allow weight data to be sent directly into record-keeping software. Printing unattended truck weight tickets has never been easier than with the Satellite’s high-speed thermal cutbar tape printer. The printer with silkscreened sign on the front of the enclosure easily identifies for drivers where they are to retrieve their ticket. To easily refill paper rolls, simply swing out the articulating arm and unlock the cabinet from the back for internal printer access. An interior heater with thermostat comes standard in all Satellite printer cabinets for year-round, weather-proof usage. 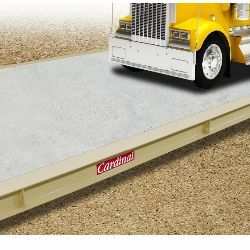 Truck scales may be equipped with many different options to increase their efficiency for both the operator and the truck driver. One of those areas that can improve efficiency is scale tickets. Scale tickets that are placed in the printer when a driver goes over the scale and then the printer prints the weight on the ticket. Stock and custom scale tickets for most major scale manufacturers in the United States are available. These are great for various markets like agricultural commodity, livestock, timber, petroleum, aggregate or any other industry. Whether carbonized bond or carbonless, numbered or un-numbered, blank or pre-printed with your company name and contact info, don’t forget to look at ticket printers and scale tickets when purchasing a truck scale.